For the last leg of The 20/20 Experience World Tour, we're back with some stylish new gear from Neil Barrett - a British-born, Italian-based fashion designer with a clean, crisp aesthetic. Adhering to a black and white color palette to match The 20/20 Experience vision, the dancers are now rocking white crop tops and the band is donning a modern take on the suit-and-tie -- t-shirt style! We featured a full interview with Barrett about his inspiration for the garments on this tour when the gear made its debut this summer. You can read all about it here. We love how Barrett blends his futuristic vision with impecable, classic tailoring. Be sure to peep the clothes during this leg of The 20/20 Experience World Tour! Justin has previously worn Neil Barrett in the music videos “Take Back The Night," Madonna’s “4 Minutes," the duet with Michael Jackson “Love Never Felt So Good," the 2013 MTV Video Music Awards, and the Legends of Summer 2013 Tour. 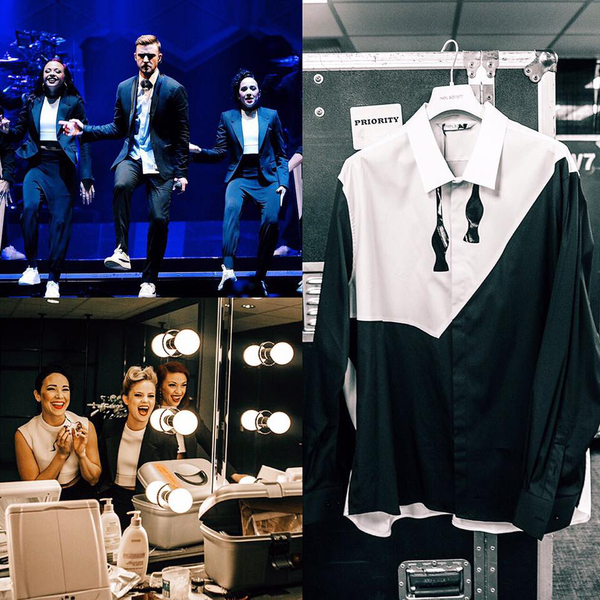 JT and The TNKids looking good as always!! !